ralph feinnes | ATTACK OF THE RED ENVELOPES! Welcome to Iraq, the most violent and chaotic place on earth. Director and co-writer Kathryn Bigelow takes us inside the lines and shows us what war looks like today in the guerilla environment of the Middle East. In The Hurt Locker, a team from an Explosives Ordinance Disposal (EOD) unit is on their final days in-country before heading back to the States. When the team leader dies in the line of duty, his replacement, SSG William James (Jeremy Renner) reports to the company to take his place. At first, SGT J.T. Sanborn (Anthony Mackie) and SPC Owen Eldridge (Brian Geraghty) think James is a loose cannon, but with hundreds of successful missions under his belt, he must be doing something right. Ever since Steven Spielberg’s Saving Private Ryan, war has been largely portrayed as ugly, gritty, dirty business. The Hurt Locker takes this ball and runs with it by visually telling us that war is literally a ticking time bomb, ready to explode at any moment, and no one is ever safe. In fact, Kathryn Bigelow borrows from Alfred Hitchcock’s Psycho playbook more than once, in that at least two prominent actors in this movie are killed off, and one of the three stars gets wounded (I won’t say who or when, of course). This movie is one of those that grabs you by the throat and doesn’t let go. Working in EOD is very intense, very stressful, and very dangerous, and to do it, you gotta have a little crazy in you. 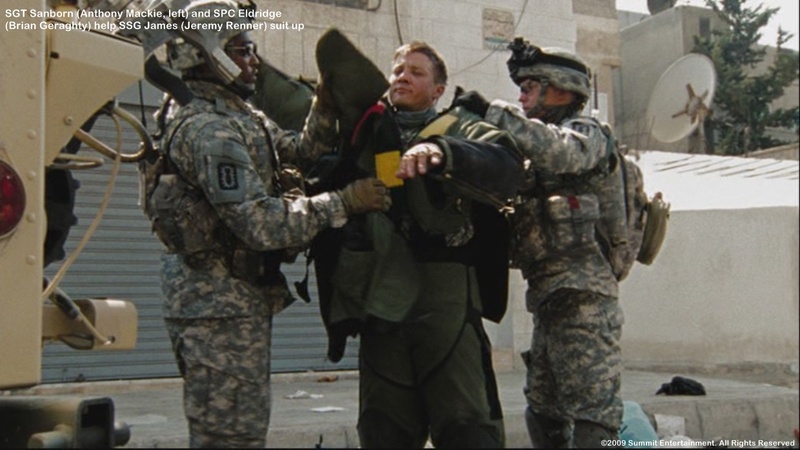 In one scene, SSG James finds so much explosives packed into the back of a car, he walks back to his team, takes off his explosives suit, and says “If I’m going to die, I’m going to die comfortable”. And I am willing to bet that nearly every EOD and police bomb squad technician agrees with that mentality (though they know they shouldn’t). Shot on location in Jordan, The Hurt Locker has built-in authenticity, in terms of locale and environment. In the DVD’s behind-the-scenes documentary, Jeremy Renner says that the sweat on the screen is real sweat. And in a hostile place where nights are no cooler than 90°F (32°C), there is no need for fake sweat! One more thing worth mentioning: Anthony Mackie’s performance as SGT Sanborn was also very exceptional. On many levels, I found myself relating to Sanborn, from how “by the book” he is, to how he somehow remains level-headed throughout most of the movie, to his desire to just get the job done. I hope I get to see more of Mr. Mackie in the future. Now to Kathryn Bigelow. Historically, war has been the pervue of men, and movies about war have been primarily written, directed, and produced by men. And most of the time, it was men who starred in nearly every movie about war since the beginnings of the motion picture industry. This makes The Hurt Locker a game-changer. Kathryn Bigelow did a superb job helming this movie, thus receiving a well-earned Oscar™ nomination (among the nine nominations for this movie overall, including Best Actor for Jeremy Renner) for 2009. Gripping, insightful, painful, reckless, and chaotic. This is an excellent movie, one that demonstrates the madness of combat in Iraq in the early years of the 21st Century.